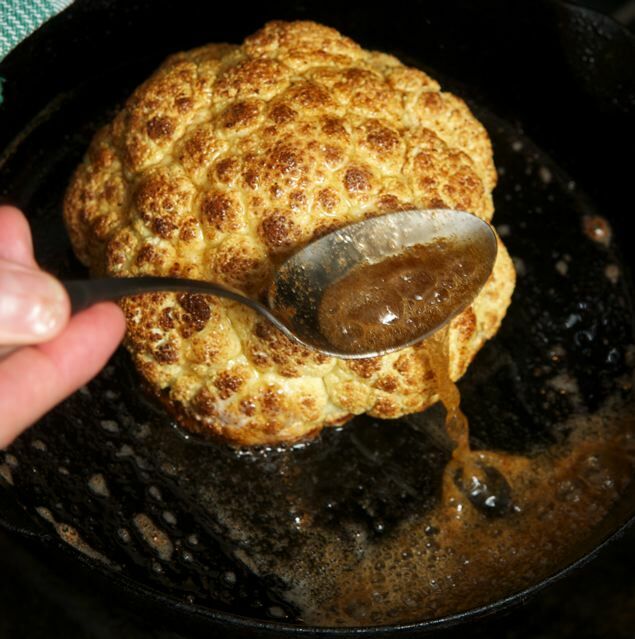 When I introduced our offset basting tasting saucing spoons, we showed clips of my basting roast cauliflower (above, photo by Donna Turner Ruhlman), numerous people asked me how to I cooked the caulflower. And just today, Ted Allen said in an email he’d roasted plenty of cauliflower but never thought to do it whole, loved the presentation it would make. Indeed, it can be roasted cut or whole. Cut cauliflower cooks faster and there’s a lot more surface that gets browned (it’s what I do when I forget to start the whole cauliflower in time). But cooking it whole is easier, and it looks so cool while it’s roasting and does make a tantalizing presentation at the table. Either way, roasted cauliflower is a great dish, either as a side dish to a bigger meal or as the center piece of a meatless meal. When I make this, Donna invariably says, “This is sooo good,” with the implication that I don’t cook it nearly enough. The following recipe for roasted cauliflower is from my new book, Ruhlman’s Twenty: 20 Techniques, 100 Recipes, a Cook’s Manifesto. Preheat your oven to 425˚F/220˚C. Cut the stem off the cauliflower as close to the base as possible and remove any leaves. Rub oil all over the cauliflower. Put the cauliflower in an oven-proof skillet. Slide the pan into the oven and roast the cauliflower for 45 minutes. Remove it from the oven and smear the soft butter over the surface. Sprinkle with a four-finger pinch of salt. Roast the cauliflower for another 30 to 45 minutes, basting it several times with the butter, which will have browned. The cauliflower in the picture has about 15 more minutes of roasting. It’s done when you can insert a paring knife into it and feel no resistence. It should be completely tender. My post and recipe on gremolata, a great topping for cauliflower. Mark Bittman says that soups can be broken down into 4 main groups: creamy, broth, earthy, and hearty. Cauliflower gratin always warms one on a chilly day, recipe shared by Dorie Greenspan. Alice Water’s book The Art of Simple Food is a great addition to your cookbook library, after you’ve worked your way through Twenty, of course! A simple but delicious thing to do with the browned butter: whisk in lemon juice, minced anchovies, and whatever chopped herb you prefer–serve with the cauliflower. I’ve been looking for something different to make and I haven’t had cauliflower in a while. Thanks … and nice photo, too. Nice! Serious BB compliments cauliflower so well. I’m thinking you serve this with a whole roasted fish. I made roasted cauliflower for dinner last night. After it came out of the oven, I doused it with a bit of fresh lime juice and tossed it with capers. OMG it was delicious. Used to do this with an egg was and parm cheese. This seems even better. I LOVE it, but I need to cook it outdoors or the house smells funky for a couple of days. It looks like some kind of crazy Yorkshire Pudding mutant. Awesome. Maybe this will get my wife to eat Cauliflower, a currently impossible task. My husband hated cauliflower, until I made this for him. I roast cauliflower all the time and my whole family loves it. I use olive oil, but I am sure it tastes a lot better with butter. Browned butter enhances any dish or baked good. Thanks for the great tip. Well, I have your BEAUTIFUL new book and will be giving this a try soon. I LOVE cauliflower. Lately I’ve been steaming it until it’s very soft, then pureeing it (till it’s completely smooth) with some warmed heavy cream and a knob of unsalted butter. It’s delicious. I served it with seared scallops, and it was a good pairing. Speaking of seared scallops, the picture in the book is mouth-watering. Kudos to you and Donna. Count me among those who never thought to roast cauliflower whole. Good idea! Love cauliflower! It also makes great mashed fauxtatoes for those of us who need to limit carbohydrates. I like cauliflower. I made this with roast chicken last night. I love, love, love this cauliflower. Can’t wait to have it again. Thanks! This recipe was easy and delish! My husband I love cauliflower and are always looking at a new ways to reinvent this tasty veggie. Thanks Michael! I like cauliflower but I don’t make it often, probably because I don’t know too many different recipes for it. I’m definitely going to try this one. I love roasted cauliflower, but never thought to roast it whole! Great presentation. My preferred flavor profile with it has been curry. I drizzle curry paste mixed with oil over the florets and roast until tender. Funny little trivia about roasted cauliflower — I went in search of a new recipe for it, and turned to Barbara Kafka (Queen of All Things Roasted). In her book, Vegetables, although she raves about roasted broccoli, she writes only, under Cauliflower, “I do not care for roasted cauliflower.” Hmph. I’d say, she’s missing out! My wife said that this is the best vegetable side that I’ve made. Made tonight. Threw fingerlings in the pan when I added the butter..Awesome!!! Zahav in Philadelphia has THE MOST DELICIOUS cauliflower. It’s not whole like this one and I think it is actually fried, not roasted, but it’s really tasty and gave me a new appreciation for this versatile vegetable. I made the roasted cauliflower earlier this week and it was fabulous. Didn’t need any sauce or topping – just salt and pepper. Next time I’m going to use some of it in soup. The aroma is amazing. This was delicious!! I kept it plain and simple. I made this as a side to Porterhouse steaks and an arugula salad with fresh figs gorgonzola and crispy procuitto. The left over cauliflower is going to be made into a soup. Thank you for a simply wonderful recipe. Oh, my! I just finished eating a big serving of this. Delicious! Thanks, Michael. Had this for dinner tonight! so yummy. It looks impressive on table and easy to make. Thanks! such a good idea. Hey Michael– we get alot of the “flower” down here in Athens in the spring- I will give this a try cause it looks fab! I make a long schiacciata with cauliflower, curried onion, raisin and flat leaf parsley. Haveyou ever prepared broccoli or Cauliflower stem picles with miso and sake? i roast cauliflower once in a while, too. wife likes it a lot more than i do. when i do it, i mix a little cumin, cinnamon, and cardamom (and sometimes cayenne) into the butter. don’t know if they eat a lot of cauliflower in Morocco, but that’s how i imagine they’d season it. I’ve wanted to make this for a long time, but only today got to it. It tasted delicious! I’ve got a question though: the back of the cauliflower was totally black (about half an inch or so), I cut it of this time. Is there anything I can do to prevent this? I LOVE roasted cauliflower! It’s the stuff veggie dreams are made of! But I have never tried roasting it whole…..now I MUST do this. have there been no more posts past the cauliflower? I feel like I’m missing something. My usual go-to cauliflower prep used to be pakora, but this one is now in the top spot. I love this recipe. I made it tonight, and hubby and I ate is as our main dish – each eating half – and we could’ve had more! YUM – MEE! Thank you for sharing this recipe!